Connolly's story is hardly unique. And the general pattern is by no means a new one, according to Bernard Weinstein, an economist and associate director of Southern Methodist University's Maguire Energy Institute. Weinstein has been observing the Texas economy for more than 30 years and says that "whenever the economy is bad in the rest of the country, that pushes people to the Sun Belt." Along with the affordable housing and a warm climate, newcomers are drawn by the notion that in the case of Texas, jobs are plentiful. Texas' unemployment rate is currently 6.4%--high for Texas but below the national rate of 7.3%. And as Connolly's story shows, these pilgrims aren't coming just from places like Michigan, where a major industry has collapsed, but also from more prosperous states like New York and California. Over the past 20 years, more than 4 million Californians have moved out of California, according to Weinstein. "That's two cities the size of Houston," he notes. Jed Kolko, chief economist for San Francisco--based real estate website Trulia, says that from 2005 to 2011, 183 Californians moved to Texas for every 100 Texans who moved to California. "Home prices, more than any other factor, cause people to leave," Kolko says. Why is California, for instance, so expensive and Texas so cheap? "God wanted California to be expensive," Kolko says, with its ideal climate and attractive but limited real estate squeezed between the mountains and the ocean. The demand for a piece of the California dream was destined to be expensive, and lawmakers passed strict building codes to add to the bottom line. Texans might argue that they have some beautiful real estate too, but in the wide-open spaces surrounding the state's major urban areas, there is no ocean to constrict growth, and there are far fewer stringent rules. There are no zoning laws in many unincorporated areas beyond the booming urban centers, where Texas has lots of land. The lower house prices, along with a generally low cost of living--helped along by cheap labor, cheap produce and cheap gas (currently about $3 a gallon)--really matter when it comes to quality of life. For instance, the federal government calculated the Texas poverty rate as 18.4% for 2010 and that of California as about 16%. That may sound bad for Texas, but once adjustments are made for the different costs of living across the two states, as the federal government does in its Supplemental Poverty Measure, Texas' poverty rate drops to 16.5% and California's spikes to a dismal 22.4%. Not surprisingly, it is the lower-income residents who are most likely to leave California. On the flip side, Texas has a higher per capita income than California, adjusted for cost of living, and nearly catches up with New York by the same measure. Once you factor in state and local taxes, Texas pulls ahead of New York--by a wide margin. 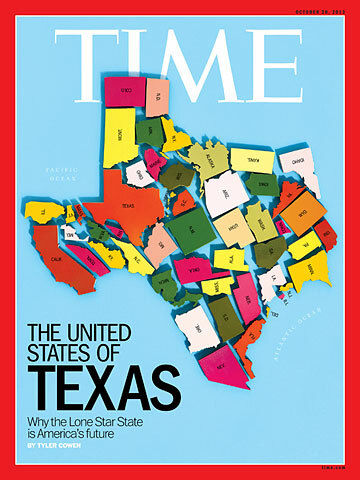 The website MoneyRates ranks states on the basis of average income, adjusting for tax rates and cost of living; once those factors are accounted for, Texas has the third highest average income (after Virginia and Washington State), while New York ranks 36th.